So you’re growing hops for the first time and things are going swimmingly. The hops are voracious growers and vigorous in appearance. It seems you have a knack for this! Until one day, you go to inspect your pride and joy and, alas, something is amiss. Perhaps the hops are wilted or covered in a powdery mildew. As prolific as hops can be, the plant may still be afflicted with hops plant diseases. For a fruitful crop, it’s important to learn about diseases affecting hops and treating hops plant problems ASAP. Poorly drained soil can lead to fungal diseases affecting hops. Black root rot – One such disease of hops plants is called Black root rot or Phytophthora citricola. This fungal disease causes water lesions on the roots of the plants, blackened or yellow leaves, and wilting stems. This hops plant disease is easily mistaken for Verticillium wilt or Fusarium canker. Fusarium canker – Fusarium canker, or Con tip blight, forms cankers at the base of the bine accompanied by the sudden wilting of the bines when flowering or when temperatures soar. The leaves at the cone tips become brown and the interior of the hop cone browns and dies. Verticillium wilt – Verticillium wilt causes yellowing of the leaf tissue along with swollen bines whose interior tissue becomes discolored. Verticillium wilt is most prevalent in nitrogen rich soils. Downy mildew – Downy mildew (Pseudoperonospora humuli) causes stunted, brittle shoots. The hop flowers brown and curl and the underside of leaves become mottled with brown lesions and a yellow halo. The plant damage will look much akin to that caused by an early frost. Gray mold – Gray mold fungus, or Botrytis cinerea, creates cone tip lesions that turn from tan in color to dark brown. This discoloration may spread for the cone tips to the entirety of the cone, becoming a gray fuzzy mold. Gray mold fungus thrives in high temperatures combined with high humidity and does not present itself in dry weather conditions. Powdery mildew – Powdery mildew (Podosphaera macularis), as its name suggests, causes white powdery fungus to develop. The symptoms first manifest as pale green to yellow spots on the top of the leaves along with white blotches on the stems and cones. Shoot growth is slow and the shoots also become covered with the white mildew. This disease thrives with high wind conditions and little sunlight. Crown rot – Red crown rot fungus, or Phomopsis tuberivora, is a red to orange discoloration on the interior tissues of the plant. This hops plant disease results in uneven root growth, yellow leaves, and climbing stems lacking in lateral branching. White mold – White mold, or Sclerotinia wilt, leaves water soaked lesions on the stem below the soil line. Leaves yellow and gray lesions appear out of the water soaked lesions while a white fungus appears on the diseased tissues. This disease thrives in conditions of poor air circulation and when it is wet and cool. Sooty mold – Sooty mold causes a flat black layer of mold on the leaves and cones, resulting in wilting bines, leaf death and reduced cone quality. This mold grows on the sticky honeydew left behind by aphid infestations. Aphids feed on the underside of hop leaves, leaving this sugary honeydew in their wake which in turn promotes fungal growth. Treating this hops plant problem means tackling the aphids with insecticidal soap. Mosaic virus – Another aphid borne disease is mosaic virus or hop mosaic virus, one of the most detrimental hops plant diseases. 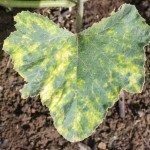 This disease causes yellow and green leaf mottling between the leaf veins and overall stunted growth. 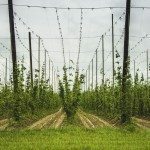 Treating hops plant problems that are fungal in nature requires the use of a fungicide. Also, to thwart mildew, keep the lower portions of the hop garden weeded and pruned back to allow light and air to penetrate. Using drip irrigation can be helpful since many of the fungal diseases are fostered by wet conditions on leaves and bines.